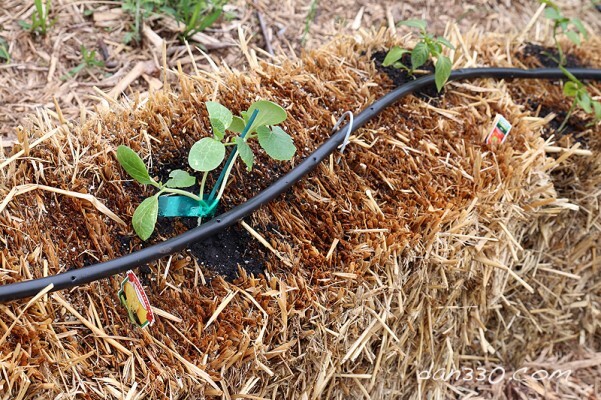 If you have been following along with this series on straw bale gardening, your bales are in place, the irrigation is set up, and the trellis’ are built. If you started a couple of weeks ago, your bales are probably conditioned as well. 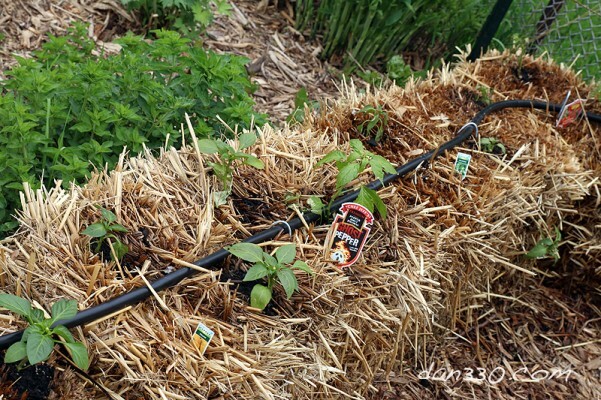 Now it is time to start planting your straw bale garden. 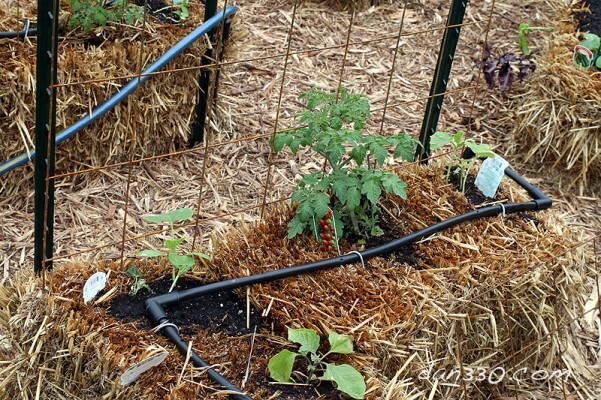 If you are new to this series, we are following Joel Karsten’s book, Straw Bale Gardening. Hi this is Chris from Dan330.com. We are doing a series on straw bale gardens. 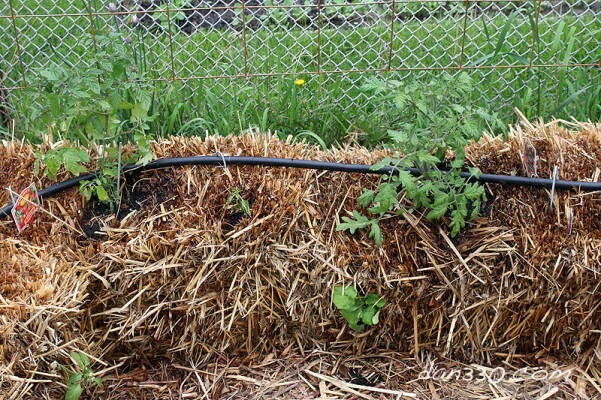 We are following Joel Karstens book STraw Bale Gardening. 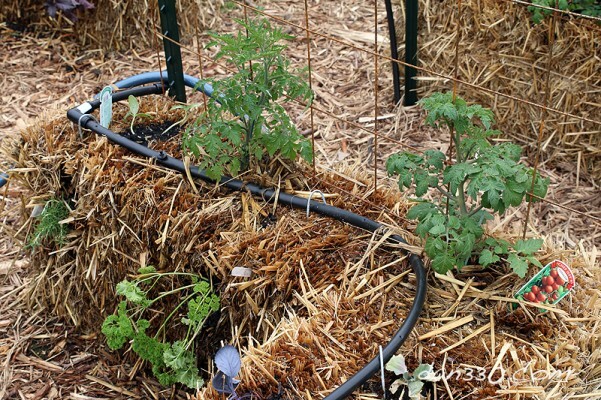 This is the first time we have ever done a straw bale garden and we are letting you know how it goes. Today, we are going to talk about planning out your garden. There are two aspects to this I want to talk about. 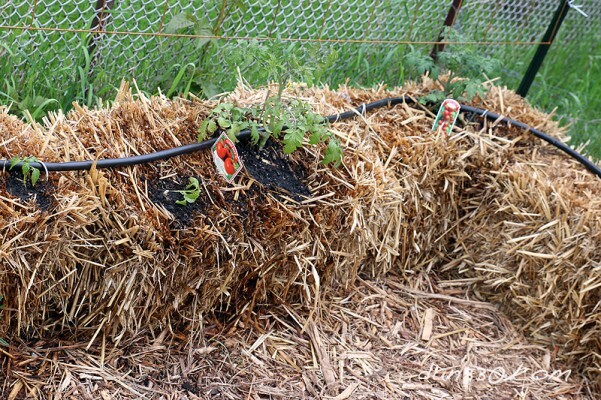 The first is how do you want the garden to look, so it is asthetically pleasing, but then, secondly, how do you want set it up to maximize what you have in each bale. So, let’s start with how it’s going to look. I like structure in the garden. Ithink it is going to add just a nice asthetic to it. We have got our garden trellis here. It’s going to be full of tomatoes and cucumbers. You can see them as they grow up here they are going to fill up. I’ve got this trellis here this is going to have green beans and peas on it. What we are going to do is to let this grow. It’s just going to produce and just an interesting thing to look at. But also its going to provide shade for these lettuces in the back there that are going to require a little more shade than just complete full sun. In the back, I’ve got the trellis for tomatoes. I want to show talk to you just real briefly, these are indeterminate tomatoes in the back so they should grow to the top of that fence no problem. I also have some taller plants around the back edges. That is going to be the backdrop for our garden. The lettuces will be in the middle, and then we have a lot of our … peppers and cabbages and things like that along this front wall. 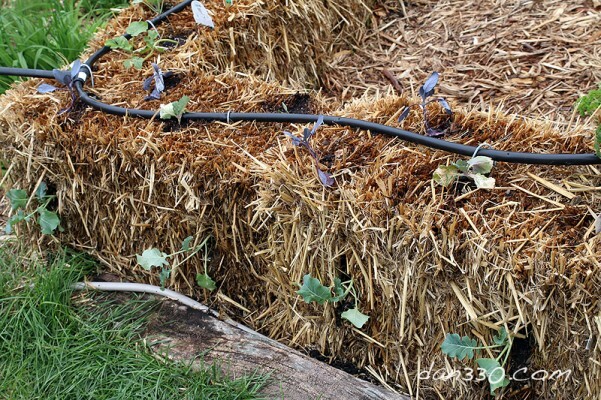 Now, one of the things that I’ve really liked in some pictures on Pinterest of straw bale gardens is that they have got these great vines that grow out and cover the sides of the bales and it just looks like this gigantic heap of garden. And you don’t even see the bales. What I did, I’v got some spaghetti squash, I’ve got some watermelon over here, we’ve got pumpkins in back and we are just going to let them grow on the outsides and a little bit on the insides of the paths as well. The vines have been very very healthy. The garden is only a week and a half old right now. And then as we walk in, I want to have all of our herbs out of the sides of the bales here. You can see a purple basil, a regular basil here, a row of herbs along this row.It might be hard to see in the shade. I’ve got some rosemary, parsley, some lavender, This is a zucchini plant, so these things are all going to fill in. So we’ve got these big paths but we are going to basically be able to tip toe through here between all the vines and all of the things growing out as well. I am breaking the planting section into four parts. 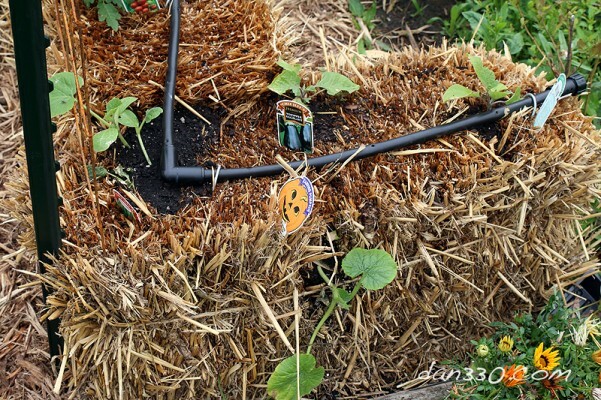 The first part is planning the plants for your straw bale garden. 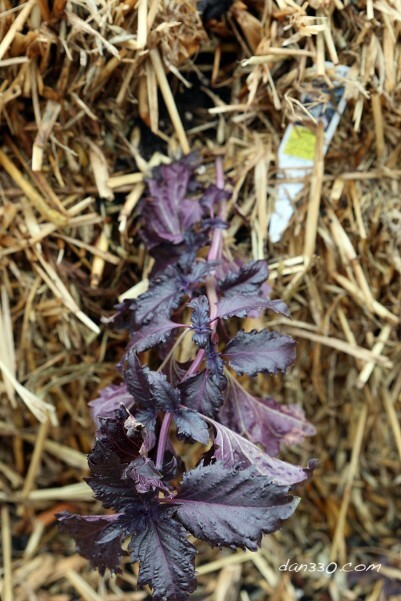 The second is tips on buying your plants, the third is direct sowing these plants, and the fourth describes how to start seed in a straw bale garden. 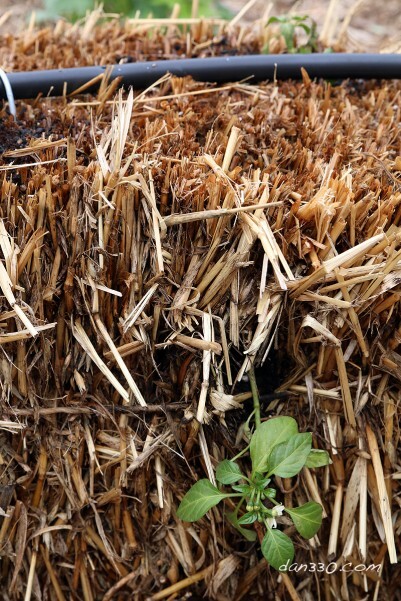 Joel says many plants work well in straw bales. After all, this makes perfect sense. All we are doing is composting organic matter that will create fresh soil and attract healthy critters like worms to do a lot of our work for us. However, there are a few that just don’t do well. 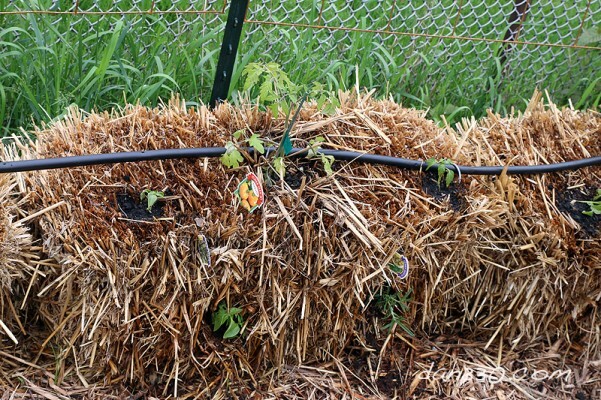 Some of the stand-out winners of straw bale gardening are vines like watermelon, squash and cucumber. One thing that a straw bale offers us that traditional gardening or even raised bed gardening can’t is a third dimension to work with. 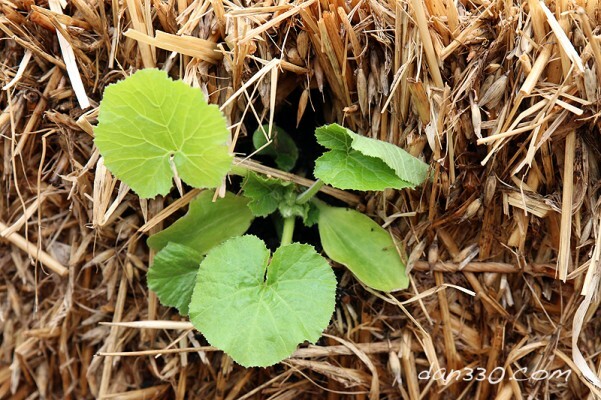 Plants do just as well growing out of the sides of a bale as they do out of the top. For this reason, I believe you can plant a few additional plants per square foot than you otherwise would. 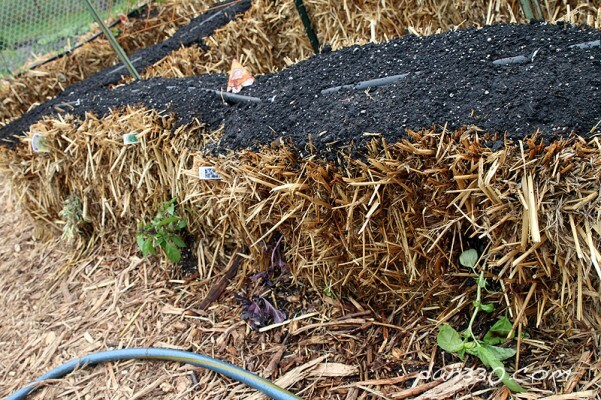 Remember, the roots of the plants will be growing toward the middle and bottom of the bales where the composting is occurring. Any seed packet or store-bought plant will have planting and thinning instructions. I followed these, and accounted for the side as well. I think the biggest consideration will not be the planting space, but the density of the plants and the airflow through the garden. I don’t want to create a garden that is too dense and limits airflow creating a situation where we might get some mold growth on the plants. We will have to just watch what happens as we grow. Worst case, we can thin plants. Joel has a wonderful chart of how many of each variety should go into each bale in his book. Here’s a list of what I planted with the number of plants per bale / combination of plants in a bale. I have two eggplants in my straw bale garden. They are on top of this bale. They share it with a pumpkin plant on the side (front) and a cucumber plant that will climb my arched trellis. When facing the straw bale garden, to the left is a bale and 2/3 of cabbage and broccoli. I planted 7 heads of cabbage and four broccoli coming out the side. Moving down the row, the next two bales of my straw bale garden each had two brussels sprouts on top. Because there was a little extra room, I planted a watermelon vine and a zucchini. As the brussels sprouts will grow up, these should crawl on the ground. I started with a watermelon plant on top on one side, and the zucchini can be seen poking out of the side below. The top of this picture is my perennial garden. I accidentally purchased two spaghetti squash. One is here. These get large and it get’s almost an entire bale to itself. You can see on the far end of this bale, I started my bell peppers. I eat a lot of peppers. Both hot and mild. 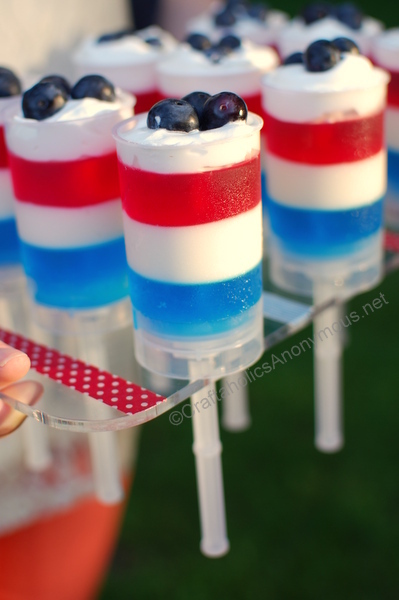 They are good in almost anything and very healthy for you. I dedicated a lot of space to these. I planted them both on top of and some on the sides of the bales. I just followed the spacing instructions on the containers. 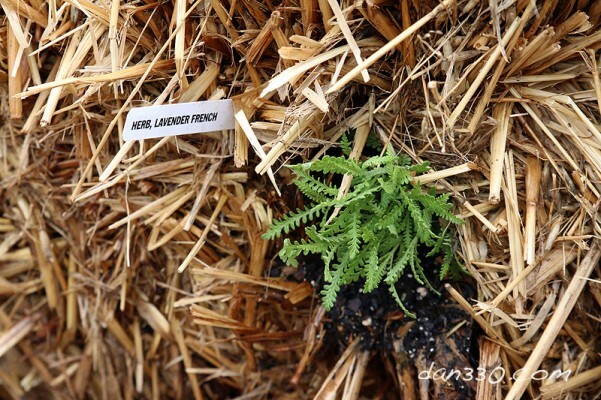 I am hoping to have a huge harvest with my straw bale garden. Here’s a picture of a jalapeño coming out of the side. The back of the garden will be a tomato wall. 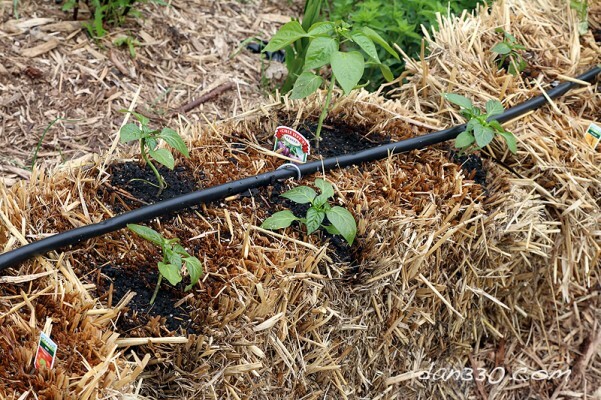 Because there is a little extra room in a bale with just one tomato plant, I spaced Cayenne peppers between them. You may notice a zucchini and herbs growing from the side into the middle of the path. Coming back toward the front, we have some big vines and our seeded area. Spaghetti Squash, Acorn Squash, Dill’s Atlantic Giant Pumpkin. So, I purchased an extra spaghetti squash. Here it is. Next to it is an acorn squash and these two piles of dirt are my Dill’s Atlantic Giant Pumpkin. 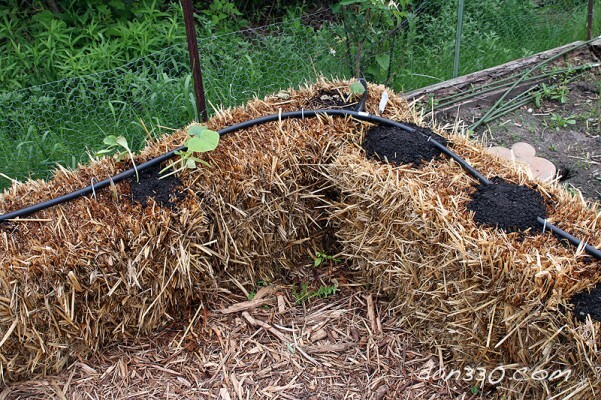 The next two posts will be how to direct plant your garden and how to seed on a straw bale. I will cover the pumpkins more there. The rest of the garden is largely seeded. I’ll get into that soon. My vision for the garden was to have a nice walkway with herbs growing out of the sides and then have the other plants growing up on top. I also want vines to grow out of the back and along the outsides. Here we have some rosemary and parsley growing out the side into the garden. 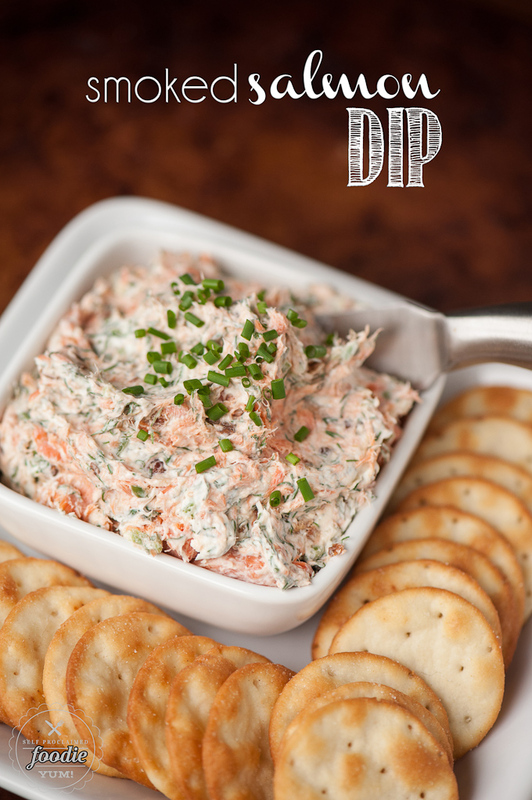 This is an example of the basil and rosemary. 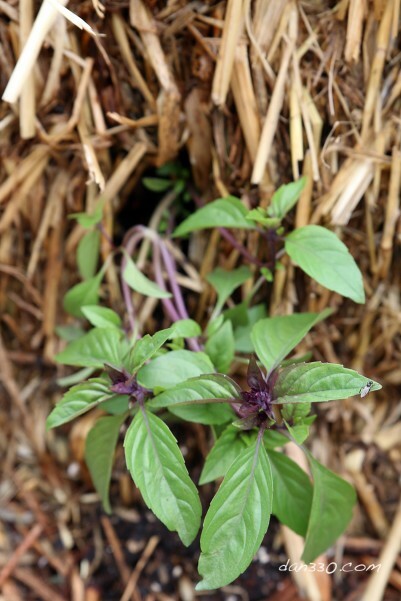 I believe this is thai basil. 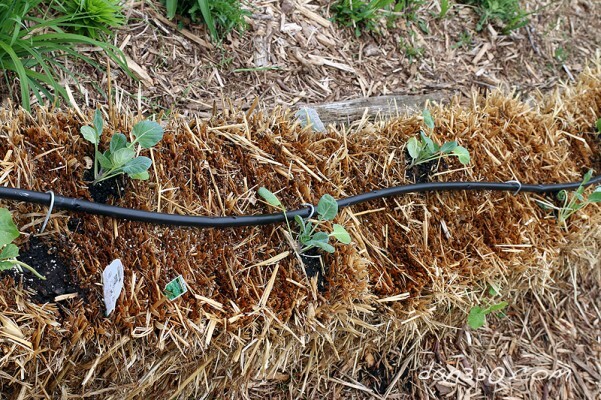 As you plant your straw bale garden, check out Joel’s book for plant spacing and follow the guidelines on your plant’s seed packet or container. 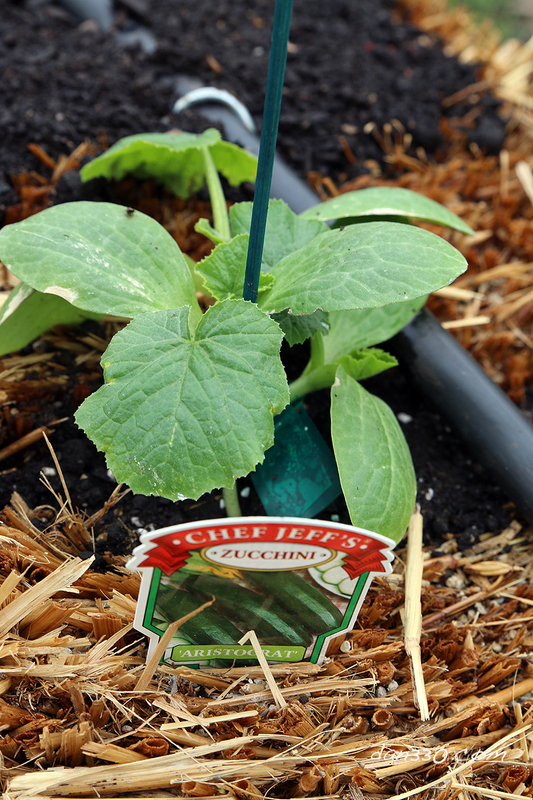 If you planned ahead, you may have seeds that are a month old by now and if the danger of frost has passed can be planted now. If not, go ahead and buy some from a store. The next post will show you some tips on buying from the store.